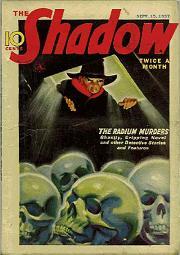 The Shadow on radio ran from 1937 through 1954, and was one of the most popular shows ever to hit the airwaves. From September 1937 through October 1938 the voice of the Shadow was none other than that of the incomparable Orson Welles. 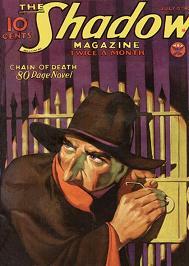 "The Poison Death" is one of the very early Welles episodes and aired on January 30, 1938. I find a lot of these Old Time Radio dramatizations--and not just from The Shadow--fascinating from a historical perspective. Case in point is this week's "The Poison Death," for it deals with subject matter very much in today's headlines: the terrorist. This terrorist targets the Department of Sanitation's water supply, and only the Shadow figures out what the police haven't been able to, and with no time to spare the Shadow is here literally a one man black ops shadow organization, skirting the law in order to do what must be done. Without further ado, here now is the Shadow in one of his earliest adventures, as he must thwart a terrorist who attempts to murder thousands by way of "The Poison Death."